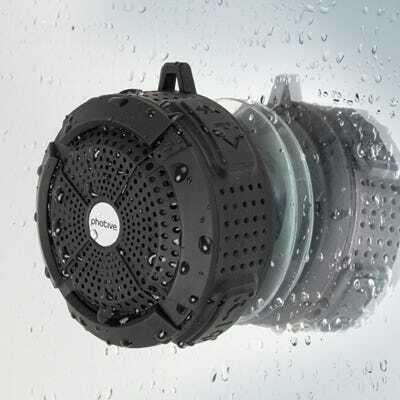 Whether you enjoy singing in the shower or you require some mindless noise to drown out your thoughts at the end of a long day, Bluetooth speakers can help you do both. Your smartphone isn't meant to endure excessive shower steam, after all, so they are the logical next best thing. To that end, Photive's waterproof portable Bluetooth shower speaker is an ideal solution to all your music-listening needs, garnering 4.4 out of 5 stars on Amazon, culled from 300-plus costumer reviews. The speaker’s rubberized, rugged exterior is tailored for ultimate impact resistance, which makes it great for much more than showers — hiking and camping are just scratching the surface of what the waterproof, shockproof, and dustproof speaker can tackle. More than that, its ultra-optimized version of Bluetooth consumes less energy (so you’re able to listen longer before needing to recharge) and delivers crystal-clear sound. While many portable speakers are criticized for not delivering volumes that can trump the noise of a shower's stream, this isn't the case here. One enthusiastic reviewer quells doubts, explaining, "This little beauty...I can crank it up anywhere in the bathroom and nothing short of a full marching band is going to mess with its sound quality". For just $20, it's probably not perfect. But, it's definitely worth a look if you want to buy a simple and compact speaker.